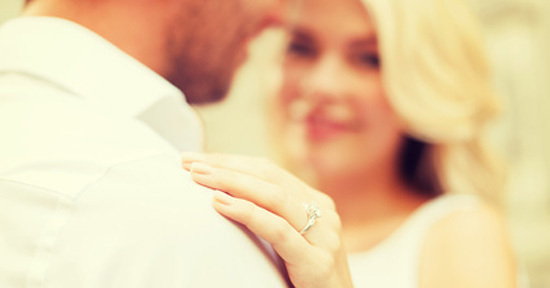 Emotions and expectations play a big part in finding the perfect engagement ring. So do your finances, especially when you're young and just starting out. Before you can find the perfect ring, you need to know where to shop. Here's a guide to the best places to buy. 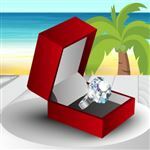 Thinking about buying an engagement ring online? View our top pick for the best place to buy an engagement ring online. We'll review 3 top engagement ring retailers: Blue Nile, Costco, and Tiffany & Co who take vastly different approaches to selling rings. Plus, we check out how 2 Internet upstarts, James Allen and Whiteflash, have shaken up the industry. Pricing Value: The same ring can cost wildly different amounts depending on where you buy it. Knowing you're getting the best value for your purchase is key. Selection: You've probably been saving up for this moment, and want only the best for your future spouse. A wide selection, for both diamond and setting, can have a major influence in your decision. Customer Experience: A positive experience means more than be treating well while you shop. From return policies to repair speeds, customer service matters when choosing where to buy your engagement ring. Before you begin, there's something you need to know as a prospective buyer. Diamonds are universally measured using the 4Cs: Cut, Clarity, Color, and Carat weight. The GIA (Gemological Institute of America) and AGS (American Gem Society) uses this rating system so buyers can compare diamonds from any retailer on an apples-to-apples basis. Tip: See how the 4Cs affect the price of a diamond, read our detailed guide here. You'll learn about each of the 4Cs, and which qualities to prioritize or save on. Without GIA or AGS certification, you have no way of knowing the exact quality of the diamond—unless you happen to be a gemologist. Note: Some retailers employ tricks like providing the clarity, color, and carat weight BUT leaving out the cut. The cut (good, excellent, ideal) is used to identify a diamond's reflective brilliance, which is arguably the most important feature. Tip: Our engagement ring guide offers a great overview of the basics of diamond shopping. Check it out BEFORE you start your search. 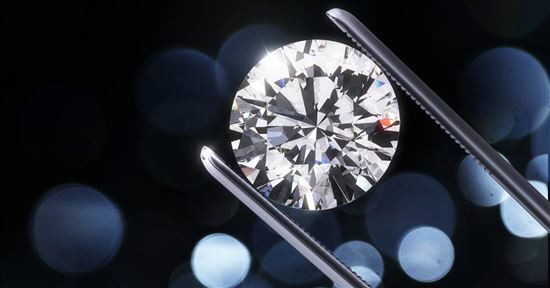 Now that you know the criteria, read on to see how these leading diamond retailers stack up. Blue Nile, the largest Internet diamond retailer on the market, is known for historically low prices and a vast selection of products. With no physical location, the company is built on the idea that loose diamonds are a commodity and should require nothing more than specs, price, and few photos to be purchased. Did you know? The tradition of a diamond engagement ring began as an ad campaign by De Beers in the 1920s. De Beers' "A Diamond is Forever" marketing plan convinced the world that a diamond was the only way to prove your love. It remains perhaps the most successful ad campaign in history. Due to its tremendous size, Blue Nile offers a vast selection of diamonds and engagement rings, all at very competitive prices. Blue Nile has exclusive contracts with diamond wholesalers all over the world, so it has by far the biggest selection of loose diamonds of the companies on our list. Blue Nile's customer service representatives are known to be highly knowledgeable and helpful with your selection, though they are perhaps a bit unpolished in comparison to other options. Most notably, the retailer consistently upholds its return policy with a simple, hassle-free process that helps mitigate the disappointment of a returning a product. Blue Nile will even include a self-addressed mailing label on your invoice copy in case you change your mind (or don't get the yes you were hoping for). They allows returns up to 30 days after a product has shipped. The benefit of being an online-only retailer is that limited overheard allows for significantly cheaper prices. Unfortunately, Blue Nile's significant growth has brought with it increased overhead. The exceptional value it once offered can now be beaten by some smaller, nimbler online retailers. If you want an engagement ring as opposed to a loose diamond, Blue Nile's setting selection is subpar compared to designer offerings at national retailers. If you're looking for a yellow gold or rose gold ring, there are only a handful of options. If you are looking to spend the majority of your budget on the diamond itself, Blue Nile is the way to go. You won't find designer settings or pretty packaging here, but you will get a high-quality diamond for the same price. Need help? Are you looking to buy an engagement ring online to save money? Check out our comparison of the best places to buy an engagement ring online. Costco is the definitive wholesale retailer. With 635 locations in nine countries, the retail giant has formed a reputation over the years for exceptional pricing, a generous return policy, and exemplary customer service. Costco combines the pricing of an Internet retailer with the benefits of an in-store experience. Customers get deep discounts and can view the diamond in person. How good is the value? In a test performed by Good Morning America, the list price of a Costco diamond was undervalued by 17%. The list price of a Tiffany diamond was found to be overpriced by 58%. Costco's primary deficiency is a somewhat limited selection compared to dedicated jewelry retailers. For the higher-end buyer, Costco offers neither the presentation nor long-term servicing of a Tiffany engagement ring. It doesn't offer a resizing option either, which can make finding the right ring difficult. On the customer service end of the spectrum, the view is generally positive. However, since Costco isn't a dedicated jewelry retailer, store staff members lack the specialized knowledge many jewelry shoppers depend on. Looking for good value? Shopping for diamonds online can be a real challenge. Read this in-depth James Allen review to see how their 360 degree videos can help you find the right stone at a good value. If you want a fantastic-looking engagement ring for a great value, it's hard to beat Costco. Unless you're going the DIY route or want the prestige of a famous diamond brand, Costco will give you the best ready-to-propose engagement ring for your money. Looking for to surprise your partner with more of a WOW factor? Read on for a review of the world famous Tiffany's. Best Engagement Ring Customer Experience: Tiffany & Co.
Tiffany & Co. is the preeminent American diamond company. Since creating the "Tiffany engagement ring" in 1886, the company has become a household name, known for top quality, top price, and top service. Tiffany & Co. is the Lamborghini of engagement ring retailers. Presenting your ring in a little blue box carries a level of prestige that other jewelry stores can't match. Every aspect of the Tiffany experience is intentionally top of the line, from the carpets in stores to the ribbon on the box. You never have to worry about getting an inferior product with Tiffany. But if you do, their legendary customer service will make it right. As with a luxury car, you pay a tremendous premium simply for the brand name. You can find similar diamonds for much cheaper with a little work. There aren't really any other downsides to the Tiffany experience, which is why you'll pay significantly more for an engagement ring. Who Should Buy From Tiffany & Co. If you need to own the branded best and can afford it, Tiffany engagement rings are hard to beat. For everyone else, there are better options for similar quality diamonds at lower prices. The best diamond deals are often found online. Find out why below. 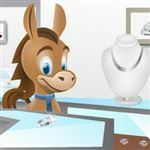 While Blue Nile, Costco and Tiffany are some of the more popular diamond retailers, there are a number of other online jewelers you should also consider. For 360 HD images, check out James Allen. For the most brilliant diamonds, then add Whiteflash to your list. Tip: Nervous about buying completely online? Consider Ritani, a company that blends the ease of online shopping with the confidence of in-person viewing. Ritani has a free in-store preview service. You can request a loose diamond or a finished ring (even a custom designed ring) to be shipped to a nearby participating jewelry store. If you love it, buy it. Otherwise, just walk away. Ritani lets you you enjoy the benefits of shopping online, without the worry of buying blind. James Allen has revolutionized online diamond shopping by providing HD 360-degree videos for every single rock in its inventory. The knowledgeable staff is available to chat 24/7 and even offers Real-Time Diamond Consultation. James Allen's Diamond Display Technology can't be beat. For every diamond (and gemstone!) in their inventory, they offer HD video. You can spin the diamond around and zoom in or out. This feature is crucial to search for visible flaws, cloudiness, or dark spots. James Allen's HD video is as good as (and perhaps even better) than seeing a diamond in person. One helpful tool is the Inspiration Gallery. Tip: After you've narrowed your choices, you can request up to 3 Idealscope images for free. These allow you to see the light performance of the diamond (if there are areas that leak light, etc.). You can also get a Real-Time Diamond Consultation so a staff member can explain the images to you and help you decide. James Allen is also a fantastic place to buy fancy shaped diamonds (shapes other than round). It has a superb collection of other shapes - larger than a lot of other online retailers. It also carries fancy colored diamonds and gemstones. James Allen offers free shipping, 30-day returns for a full refund, lifetime warranty, and 100% lifetime upgrade. There is little downside to shopping at James Allen. The selection may not be as big as Blue Nile, but it's not small, either. However, if you're specifically looking for a super ideal cut diamond (or True Heart diamond), your choices will be limited . Consider browsing Whiteflash (more on them in a moment). James Allen has created a brand for the everyman with affordable pricing, good selection to suit every taste, and great customer service. Most importantly, you can feel confident in your purchase with James Allen because you can see the actual stone you're buying. Related: James Allen vs Blue Nile: Read this comparison to learn more about the differences between these two online retailers. Whiteflash is known for their A CUT ABOVE® diamonds, the largest selection of in-house super ideal cut of any retailer in the world. Their grading standard is extremely stringent. To qualify for the A CUT ABOVE® line, a diamond must pass all requirements. These diamonds truly represent the best of the best. Whiteflash provides an exceptional amount of data for all their in-house diamonds. Along with an actual photo, you also get a Idealsope image and ASET image (both of which show light performance) as well as hearts and arrows patterning (which shows symmetry). You can also view an HD video showing the fire and scintillation (in laymen's terms, how sparky the rock is). All this data takes the guesswork out of your purchase so you can shop with confidence. Whiteflash also offers an expert selection of diamonds that didn't quite make it into the A CUT ABOVE® line. Since their requirements are so strict, these diamonds often have tiny flaws that the human eye can't even see. Here is where you can find a great balance of quality and price. Whiteflash offers 30-day returns for a full refund, one-year buyback (for 70% of purchase price), one-year service plan, and 100% lifetime upgrade for their in-house diamonds. Whiteflash's in-house inventory consists of round and princess cut diamonds only. They have a virtual inventory with the other shapes, but you don't see the actual photos or detailed data upfront. If you do purchase a diamond from the virtual inventory, it will be brought in for evaluation and the results will be presented to you. Another drawback is that Whiteflash only offers a 90-day 0% APR financing option for online purchases (6 months for in-store). So make sure you have the budget to pay in full or have another plan to finance your ring. Tip: One of our favorite ring financing tips is using a credit card with a long 0% APR introductory offer. You can buy much more time to pay off this large purchase interest-free. Whiteflash is for those who value quality and understand the importance of cut. If you want a diamond with the brightest sparkle--and have the budget for it--you'll be hard pressed to find a rock more perfect than Whiteflash's A CUT ABOVE® diamonds. Set a budget. Come up with a budget that will not put you into debt or delay other big life plans. But at the same time, show her that you are committed. If you need to, talk about your finances together so you're on the same page. Save for the ring. It's best to be able to buy the ring in cash, so you don't go into debt. If you must finance an engagement ring, however, make sure you pick the smartest option. Research prices beforehand. Take the time to understand how diamond pricing works. It's a good idea to at least browse on Blue Nile and James Allen to get a better idea on how much rings actually cost. Know her style. The ring should match her personal style. Is she more of a simple solitaire kind of girl, or a "the shinier the better" type? It should also fit with her lifestyle. If she's super active, a high-set ring would not be a good fit. Diamond Size: Look for a diamond just slightly under a full carat (or half carat) for a huge drop in price, yet no visible difference in size. Diamond Color: A diamond with color H will appear white face-up, yet cost significantly less than a colorless stone. For yellow gold or rose gold bands, you can safely go down to a J or K in color and save even more. Diamond Clarity: You don't need a flawless diamond - only one that has no flaws to the naked eye. We recommend a clarity of VS2 as the sweet spot. Diamond Shape: Another shape other than round can be as much as 40% cheaper. If you're still having trouble deciding, check out James Allen's Inspiration Gallery. You can filter engagement rings by ring style, shape, metal type and budget. For our best expert tips, check out our detailed article on what affects diamond prices. Learn exactly how small difference can affect the price and where to get the best value. Better selection: Online jewelry stores carry a much larger selection than your local jeweler. You'll be able to find diamonds and ring styles at every price point. So you can find a lot more options within your budget. Better price: A website doesn't have the same overhead costs of a physical retail store. In our independent study, we found that online stores have prices as much as 50% lower. And another advantage is that many do not collect sales tax outside their state. It's also much easier to comparison shop online than it is to go to several physical stores. Better zoom: A lot of online stores now have high-tech tools that allow you to zoom in on the photo of the actual diamond. You can zoom in and really examine the diamond for any imperfections. This is even better than looking at a diamond in the store. Free returns: Most online jewelers offer free returns within a certain window. So you don't need to worry about being stuck with a ring you don't like. No pressure: You can take your time to choose a ring on your terms without feeling the pressure of a salesperson working on commission. Plus, if you are a less traditional couple (LGBT, have a huge age gap, etc), you can feel more comfortable shopping from home. Mall jewelry stores: Chain jewelry stores have much higher prices due to overhead. You'll find prices up to 50% higher than online stores. And they often have very limited selections of high quality stones. Online classified: You're taking a risk if you buy an engagement ring from sites like Craigslist. What if the ring was stolen? Or the previous owner switched out the diamond for a fake? Never exchange money until you've gotten the ring appraised and verified that it's up to the quality standard the seller claims. Anywhere without a clear return policy: Never buy from a store (physical or online) that does not have a 100% no-questions-asked return policy within a reasonable time frame. Here are some other unique, notable online jewelers to consider. Ritani: for free in-store preview. If you're worried about buying an engagement ring sight unseen, Ritani allows you preview your ring in-person for free before taking it home. After you have designed your ring online, you can get it shipped to a local partner jeweler for preview. If you love it, take it home with you that day. If not, just walk away and you won't be charged. Ritani offers competitive prices on diamonds and unique, high quality settings. It offers free 30-day return (with FedEx pickup option) and lifetime warranty. Brilliant Earth: for ethically sourced diamonds. Brilliant Earth is one of the leading jewelers for ethically sourced diamonds. Their philosophy goes beyond merely conflict-free. All their diamonds come from ethical mines with fair wages, safe working conditions, and without human rights abuses. Their prices may be priced a little higher than other online jewelers. It also has a nice selection of ethical lab-created diamonds at cheaper prices. Brilliant Earth offers free 30-day return, lifetime warranty, and 100% lifetime upgrade. Brian Gavin: for quality, super ideal diamonds. Brian Gavin is the leading authority on super ideal hearts & arrows diamonds. It offers some of the best quality diamonds at affordable prices. Every diamond from Brian Gavin has true hearts & arrows patterning, is AGS Triple 0 certified, eye clean, and conflict free. It offers a range of product lines to suit different budgets. Brian Gavin offers a 15-day return window, lifetime warranty, and 100% lifetime upgrade. Leibish & Co.: for fancy colored diamonds. If you're in the market for a colored diamond, Leibish & Co. is the place to go. This jeweler specializes in fancy colored diamonds and has one of the largest online collections. They offer both loose diamonds (in any color, shape, and size) and diamond jewelry specially designed to bring out the best of the diamond. Lebish & Co. offers 30-day return and lifetime warranty. Your budget and comfort level with certain types of retailers may determine where you shop for an engagement ring. Do you live fairly close to a Costco and have tighter budget? Then check it out--you may be surprised by the value that can be found there. If you're the shy type and don't want to be hassled by salespeople, consider an online retailer like, Blue Nile. And if you're all about luxury and prestige, Tiffany's can go a long way toward winning over your loved one… for a price. Watch out: an engagement doesn't always end in a wedding. If you are hoping to get married, read on for 23 danger signs that your dreams of a happily ever after may NOT come true. Share on Facebook "Best Place to Buy an Engagement Ring"